Long Beach, Calif. – July 12, 2009 – Formula DRIFT returned to Las Vegas Motor Speedway for Round 4: All In. 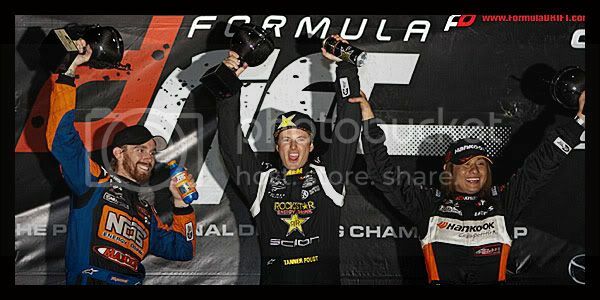 Champion Tanner Foust takes the victory in his Rockstar / Hankook Scion Racing tC, while Chris Forsberg in the NOS Energy Drink / Maxxis Nissan 350Z moves to the top position overall in the chase for the Formula DRIFT Pro Championship. For the 2nd consecutive year, Formula DRIFT returned to Las Vegas Motor Speedway. The 2-day weekend event was filled with non-stop Formula DRIFT and Pro Am action. Fans were also treated to the Jtuned Auto Gallery car show, Wicked H.P. drag competition, and Bikini Jam. Chris Forsberg took over the point lead after a close battle with Ryan Tuerck, who was ranked #2 going into the event, in the Great 8 round. Forsberg then went on to defeat Tyler McQuarrie, in the Falken Tire Nissan 350Z, in the consolation round for 3rd place. 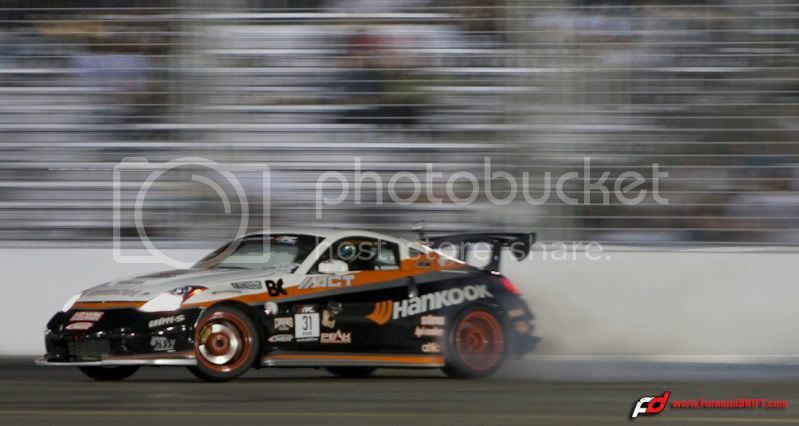 The final battle was between Hankook Tire teammates Tanner Foust and Ryuji Miki, piloting the APEXi / Hankook Mazda RX-7. Foust proved why he is the returning champion and blinded Miki in the first run with a cloud of thick smoke that caused Miki to lose his drift, while giving chase in their first tandem run giving Foust the advantage. 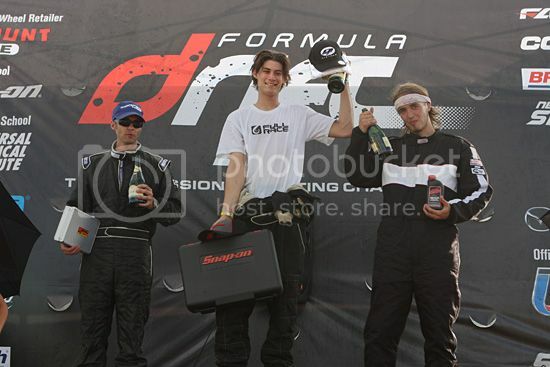 With a solid 2nd run, Foust was able to sit on top of the podium once again. Formula DRIFT returns to Evergreen Speedway on August 8-9. Tickets are on-sale now. 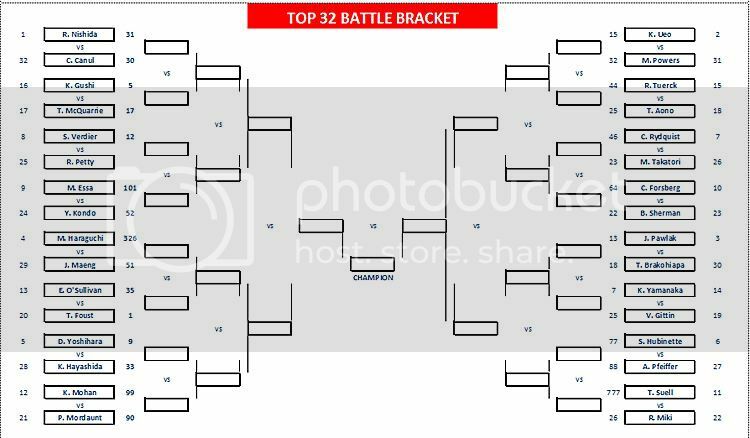 This is the Top 32 Competition Bracket from tonight’s Round 4: All In event at Las Vegas Motor Speedway. Live blog updates throughout the evening and also round by round Tweets via Formula DRIFT Twitter. Congratulations to Robbie Nishida for Qualifying 1st. Notable notes…point leader Darren McNamara fails to make it into Top 32 competition due to car problems in his Saturn Sky and trying to qualify in teammate Calvin Wan’s Nissan S15. Rhys Millen also fails to qualify into the Top 32. Both Formula DRIFT drivers Darren McNamara and Chris Forsberg will be in-studio today on Hot 97.5. If you’re in the Las Vegas area be sure to tune in during the 8 AM hour. Stay tuned to the FD Blog for more on Round 4: All In. Today we have an autograph signing at the Las Vegas Town Square Mall at 6:30 PM – 7:30 PM and a Charity Blackjack Tournament featuring some of the top FD drivers at Aliante Casino / Hotel.